Parabolic-trough solar water heating is a proven technology that directly substitutes renewable energy for conventional energy in water heating. There are several industrial processes that really need these very high temperatures, for example steam generation, washing, drying, sterilization, pasteurization, coloring, chemical treatments, and so on. 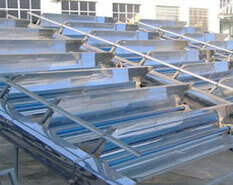 Parabolic-trough collectors can also drive absorption cooling systems or other equipment that runs off a thermal load. Solar heat is well suited to heat water or generate steam for indirect-fired absorption cooling because of the close time match between solar heat generation and the need for cooling. Because air-conditioning frequently drives peak electrical demand, the time match of parabolic-trough energy collection to air-conditioning needs is a significant attribute. GEAR Solar's METVAC Linear Receivers can be custom manufactured in lengths of 4 meters and 8 meters consisting of 70mm to 100mm diameter stainless steel tubes with a special solar-selective absorber surface; surrounded by an anti-reflective evacuated glass tube with various diameters.